Codeta.com – Best Online Casino with Live Dealer Games! Codeta.com is an online casino website that was launched in 2016. The gambling website is operated and managed by EveryMatrix Ltd. This online casino is home to some of the best casino games. Codeta Online Casino is licensed and regulated by Malta Gaming Authority, UK Gambling Commission and Curacao eGaming. The website is simple, yet beautiful and effective. The home page of the website shows off impressive graphics in a black and white theme and Clubs in the logo. In addition, the casino site is also user-friendly and easy to navigate. Customers can easily find their favourite games, contact the support team or read more about the casino. The Codeta.com casino can work seamlessly on different types of devices because it is designed with instant-play functionality. As a result, players can access the casino without having to install apps on different platforms. You can even play it on your smartphone, tablet and laptop. Bonuses and promotions keep on running on the website to pamper the players. And when playing in the casino everything is always safe and sound when it comes to the security of the user information. There's a delightful welcome bonus awaiting the new players at Codeta.com. The casino doubles your first deposit up to €300. The minimum amount you need to deposit in order to be eligible for this bonus is €10. Moreover, you must claim this bonus within 24 hours after signing up with the website. Also, to withdraw this bonus, you need to wager the total amount of your bonus 30x over within seven days. This casino also has a top-up/cashback promotion that runs for your first week at the casino. You can earn extra money for your gameplay during this time, up to a maximum of €5,000 in real cash. Depending upon your performance during the first week's play at the casino, you will either be awarded a 10% top-up, or a 10% cash back. Apart from the welcome bonuses, the casino runs daily & weekly promotions with free spins, reload bonuses, free cash bonuses and so on. That's not all, as a regular player you can also join popular casino tournaments with massive cash prizes to be won. So, are you ready to make the buzz in the lobby? With so many software providers on the board, it allows the casino to ensure variety over its whole library. Codeta.com focuses mainly on classic table games such as online Blackjack, Roulette, and Baccarat. The blackjack table itself is impressive, with the variants including White, Silver, VIP, Platinum, Controlled Squeeze, Multiplayer Common Draw and much more. Baccarat games also top the list, while poker players also have access to variants like Three-Card Poker, Ultimate Texas Hold’em, Casino Hold’em and Caribbean Stud. So pick your game and join a table for the best gaming experience. If you love playing live casino games, you will be spoilt for choice at Codeta.com because the website is well equipped with a plethora of live casino games. In addition, the casino players can find over 500 online slots, including classic slots, video slots, and progressive slots. Especially the latter games offer larger than life pay-outs, eg. Mega Moolah, Cosmic Fortune, Arabian Nights, and Mega Fortune are one of these grand slots. Transactions can be done in supported currencies which include Euros, Pounds, and Swedish Kronor. The minimum deposit amount and the minimum withdrawal amount is €10. The casino website is secured with SSL encryption which ensures that all the players’ sensitive information remains private, secure and undisclosed to third parties. Also, all the casino games and software found at Codeta.com Casino is certified by independent audits. Players who need to contact the Codeta Casino support team to raise queries can do so via Live Chat and E-mail. The customer support team is available every day of the week, 365 days a year. There is also a wealth of frequently asked questions (FAQs) and game tutorials that helps players understand the intricacies of Codeta Casino. The customer support team speaks English, Swedish, German, Norwegian and Finnish. 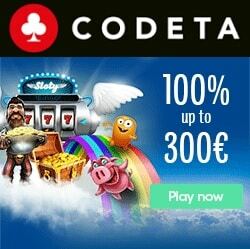 Codeta.com is a recent addition to the list of online casinos, and it is indeed a very welcome one too. The casino stands out from the crowd by offering a great casino experience coupled with premium live table games, trusty tutorials, and weekend payouts. So, if you’re looking for a classic yet modern casino, offering hundreds of top quality casino games and slots, then you must definitely try out Codeta.